Adding the sites to the map is a feature of Version 6. To do this, go to the setup module and click setup. Go to tab 3 (Pick List) of the form that opens. Scroll down to find ‘Site’ and left click. On the right side of the screen, double click in the open space and find the site that you would like to edit. Be sure to fill out all the necessary fields. 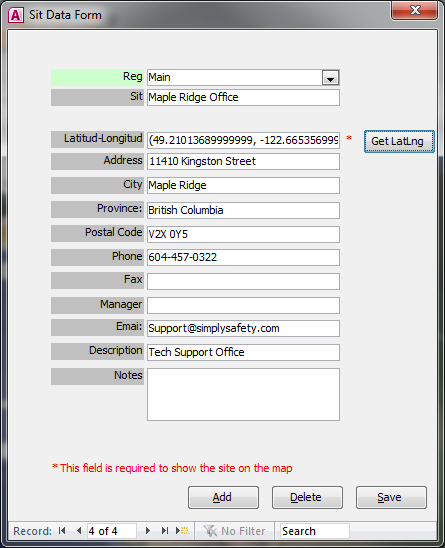 Once you have the LatLng filled in, click on “Save Position” and the Coordinates will be entered into the Site Data Form. Click “Save” and the new location will be added to the map. Clicking on the Coordinate will give you specific “Site” information.